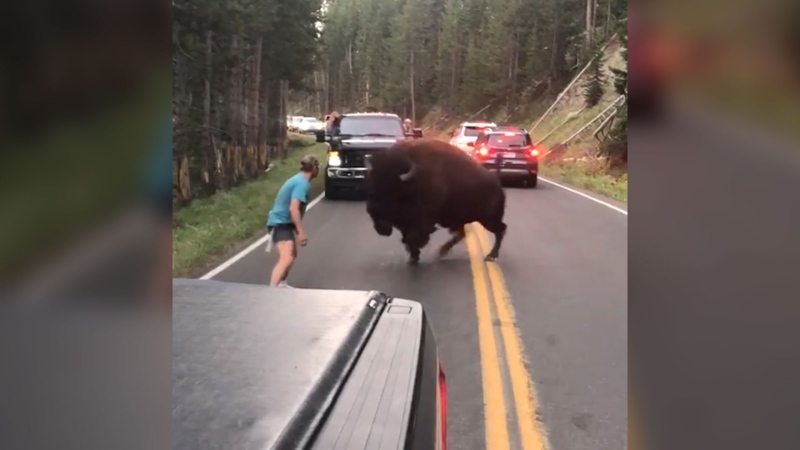 U.S. park rangers have arrested a suspect after a viral video showed a reckless man taunting a bison in Yellowstone National Park. A foolhardy man, apparently brimming with too much confidence and not enough sense, taunts a gigantic bison in Yellowstone National Park in a video that’s gone viral online. The footage was recorded by tourist Lindsey Jones as she was driving through Hayden Valley on Tuesday. At first, it appears as if the man is trying to encourage the large animal to move to the side of the road by yelling at it. However, when the bison walks over to the shoulder of the road, the man continues to follow it and thump his chest with his fists. That’s when the encounter takes a turn. The video shows the bison lightly charge at the man who appears to welcome the challenge by hitting his chest again. As the animal approaches, the man is seen dodging it at the very last second. Despite the close call, it seems as if the man is not ready to back down. He can be heard loudly grunting as he makes another threatening gesture towards the animal. As the bison charges towards the man again, Jones turns the camera away. “Oh God. Oh God. I can’t watch it,” she’s heard exclaiming in the video. It seems the man avoided being gored because he’s seen standing on the road, apparently unharmed, when Jones focuses the camera back on him. After a tense moment, the bison and the man are shown going their separate ways. Jones posted the video on Facebook where it has since racked up more than 9,000 views and been shared more than 82,000 times. “We appreciate the collaboration of our fellow rangers in Glacier and Grand Teton national parks on this arrest. Harassing wildlife is illegal in any national park,” Yellowstone National Park Supt. Dan Wenk said in a statement released Friday. Officials said Reinke had been visiting several national parks over the weekend. Rangers first arrested him in Grand Teton National Park for alleged public intoxication and causing a disturbance. Reinke then travelled to Yellowstone, where local rangers stopped his vehicle on July 31. He again appeared to be intoxicated and was cited for not wearing a seatbelt. “It is believed that after that traffic stop, Reinke encountered the bison,” according to a statement from the U.S. National Park Service. Wenk said park regulations require visitors to stay at least 22 metres away from animals such as bison and elk and at least 91 metres away from bears and wolves. “These distances safeguard both visitors and the remarkable experience of sharing a landscape with thousands of freely-roaming animals,” he said in a Facebook post. “People who ignore these rules are risking their lives and threatening the park experience for everyone else." If the video doesn't display, please click here to view it.